Fifteen years have passed since Sanaa Gamil died, 22 December 2002. An embodiment of The Cactus Flower, one of her most memorable roles on stage, Sanaa was herself resilient, overcoming conservative ideas in order to bloom under the sun of art. Her birth name was Thoraya Atallah, born in Al-Minya governorate 27 April 1930. She wasn’t only an orphan, but had confronted her brother who had thrown her out of their home on a cold night because of her love for art. She endured much before entering the world of professional acting, but was exceptional and endowed with an individual style in performance, regardless of the nature of the characters she personified. Her early beginnings were on stage in Molière plays: The Miser, The Imaginary Invalid and The Affected Young Ladies, directed by her mentor Zaki Tulleimat, or The Pharaoh’s Downfall written by Alfred Farag and directed by Hamdy Geith. Her cinematic beginnings, which coincided with her theatrical ones, were very humble to the extent that she didn’t capture the attention of either the audience or big directors in the 1950s. 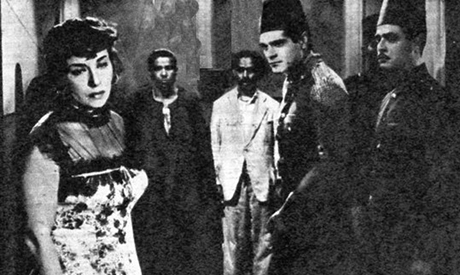 Her cinematic breakthrough came at the hands of Hassan Al-Imam in The Rule of the Powerful (1951) in which she starred with Farid Shawqi and Huda Sultan. However, her subsequent roles in the 1950s didn’t point to the presence of a new star actress. Perhaps the reason was that the cinematic scene was saturated with well-established female stars, leaving little room for any newcomer, especially if coming from the stage. The same happened with her colleagues Samiha Ayoub and Naima Wasfi who belonged to the same generation. Sanaa Gamil later acted in dozens of films, such as: My Father Deceived Me (1951) directed by Mahmoud Zulfikar, A Window Overlooking Paradise (1953) by Ahmed Diaa-Eldin and April’s Fool (1954) by Mohamed Abdel-Gawad. She wasn’t particlulary noticeable except in Shame on You (1953) directed by Essa Karama, starring Ismail Yassin and Lola Sedki, where she played an innocent girl helping her fiancé who was influenced by her deviant uncle. With a series of theatrical successes at the end of the 1950s, especially after the play The Prince of Darkness written by Tawfiq Al-Hakim and directed by Fatouh Nashaty, her presence demanded that filmmakers begin to take note of her. Indeed, that happened when director Salah Abu-Seif rediscovered her and made the turning point in her cinematic career by casting her as Nefisa in The Beginning and the End in 1960, adapted from an eponymous novel by Nobel laureate Naguib Mahfouz, after Faten Hamama declined the role. Sanaa Gamil was bold in accepting to play this character who was deprived of everything: beauty, education, good fortune and familial stability. The actress was fully aware of the character’s dimensions. She was certain that despite all her points of weakness, Nefisa had the desire to give and make everyone around her happy without others paying attention to her basic needs for kindness and solicitude. Thus, her resistance was weaker and more painful and her downfall stronger and more impactful. Sanaa Gamil perceived that Nefisa wasn’t just prone to fall, but to gradually decline, and that such a character couldn’t resist the "rolling" of the descent and was marching towards an inevitable fate. This impeccable understanding of the character’s dimensions drove the great writer Naguib Mahfouz to state once that Sanaa Gamil recreated the character on the silver screen exactly the way he had had in mind. The role earned her the award for Best Supporting Actress at the 1961 International Moscow Film Festival. Entering the 1960s with The Beginning and the End under her belt, Gamil was very selective in her film choices. Her milestones began to emerge such as her role as an aristocratic lady in Dawn of a New Day directed by Youssef Chahine in 1965, and the liberal lawyer who was motivated by her sensual desires in The Impossible (1965) by Hussein Kamal. She followed the same trend on stage and her significant roles came in succession making her the doyenne of the Arab theatre in plays such as The Smoke, The Merchant of Venice, Neighboring Quarters, Shams Al-Nahar (The Day’s Sun) and others. From the theatre to cinema and vice versa, Sanaa Gamil enjoyed her years of artistic maturity to the full. Once again, she soared with Salah Abu-Seif in The Second Wife (1967), where she proved once more her superb perception of the character’s dimensions. Her depiction of Hafiza, the mayor’s first wife, wasn’t weak as Nefisa in The Beginning and the End. Perhaps her only weakness was her sterility, but she derived her strength from her ownership of agricultural lands and inheritance from a greedy mayor. The success of The Second Wife drove her to another stage success. For in the following year, 1968, she performed one of her most memorable theatrical roles in The Cactus Flower along with Abdel-Rahman Abu-Zahra and directed by Kamal Yassin and translated from an eponymous play written by Barillet and Gredy. As usual, her performance was sober and fully perceptive of the inner side of the character of Jihan. Jihan in The Cactus Flower shares a common characteristic with Nefisa in her limitless capability to give. However, she was never weak or submissive like Nefisa. Probably, she was as strong as Hafiza but her strength originates from embracing and loving others, not the power of arrogance. Jihan’s strength emanated from within. Thus, she was able – like the cactus – to overcome the emotional dryness in others. The characters played by Sanaa Gamil – except Nefisa – didn’t forsake their inner strength no matter the sources of this strength and outward manifestations. This kept recurring throughout the last 25 years of her artistic career: theatrically in the monodrama The Horse by Karam El-Naggar, and The Visit by Friedrich Dürrenmatt; and cinematically in The Doubt My Dear (1979) directed by Barakat, The Unknown (1984) adapted from the play The Misunderstanding by Albert Camus and directed by Ashraf Fahmy, Mr K (1994) by Salah Abu-Seif, The Lady’s Chauffeur (1994) by Hassan Ibrahim and her last film, Smile, So the Picture Looks Beautiful (1998), by Sherif Arafa. She had also given remarkable performances in a number of television series such as Eyes, The White Flag, The West Bank, and Aunt Safiyya and the Chapel. Sanaa Gamil will remain one of the icons of Arab drama, always regarded with respect and high esteem.